At his Baptism, Jesus offered himself and his life to God, and received God’s blessing. That was a glorious moment. But it was only the start. Jesus had committed himself to God, but now he had to actually live the life – and being human he has to face what we all face – temptation. Before Jesus could teach others and then save them, he had to meet Satan face to face, confront him and defeat him. The loneliness of this struggle was terrible. There were no friends to support him, only the wild beasts and the harsh desert. doubt the reality of his Father’s love and care. Jesus had fasted for forty days. Note: ‘forty’ is a significant number, reminding us throughout this story of the forty years the Hebrew tribes spent in the wilderness as they travelled towards the Promised Land. Mosaic of Jesus tempted to turn stones into breadFasting probably meant living off the land rather than going entirely without food or water. 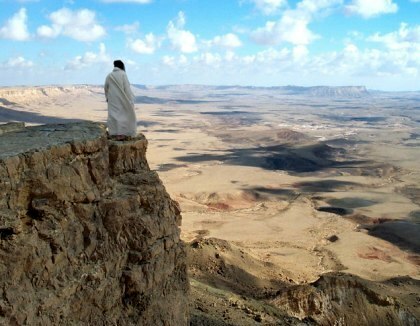 There is not much water and very little food in the desert, but Jesus survived, though he would have been physically weakened and mentally drained. This is when the Devil was most able to entice him – watch yourself and your actions when you are tired and drained. This is when the Devil strikes. 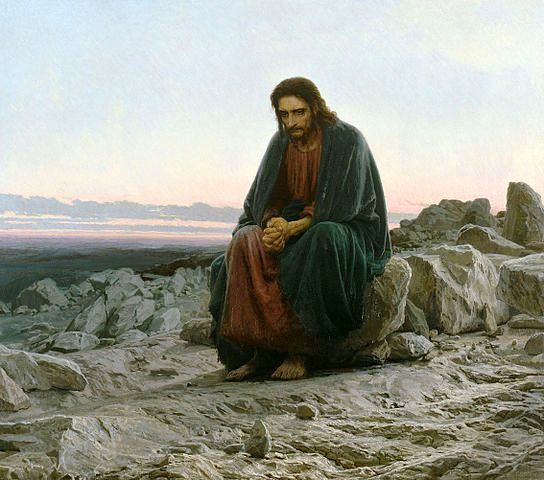 The first temptation urged Jesus to use his status as the Son of God to perform an act of power to satisfy his hunger. This was not simply about food. It was more subtle than that. The Devil was urging Jesus to upset God’s pattern of creation by making something into what it is not meant to be, and moreover use his power as Son of God for his own ends instead of in God’s service. But Jesus was the New Israel, and he would not abandon God as the Hebrews did when they turned to the Golden Calf, itself a symbol of food and fertility. A person’s true character is not dazzled by magic tricks. Jesus would not do as the Devil suggested. 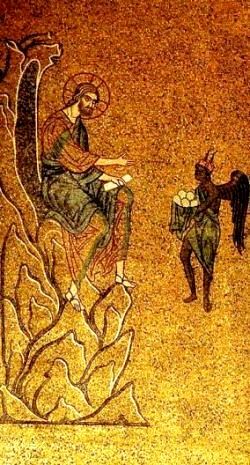 The Devil/Evil tried a second ploy.Jesus tempted at the pinnacle of the Temple He took Jesus to the ‘holy city’- presumably Jerusalem. There he lifted Jesus and placed him on a ‘pinnacle’ of the Temple. This was probably some projecting turret or rooftop. Curiously enough, the punishment for blasphemy at the time was to be thrown off the pinnacle of the Temple. ‘Now jump’ said the Devil. ‘God will surely protect you from harm, since you are His Son. He will send an angel to scoop you up and keep you safe.’ With breathtaking blasphemy, the Devil quoted God himself – a brilliant, seductive ploy. But the quotation had been ripped out of its context so the Devil was, in effect, mocking God’s words. Jesus’ response was contemptuous, dismissive. ‘You shall not tempt the Lord your God’ – a quote from Dt. 6:14. No-one, said Jesus, not even the Devil, could put God the Creator to the test. We are God’s creatures, He is not ours. Jesus knew, as we do, that a person tests the faithfulness of God only when he no longer truly trusts God. Keep in mind that Satan/Evil is real, then as now. We ourselves must expect similar conflict, and with Christ’s help we may enjoy a similar victory. Jesus offered all the kingdoms of the world The Devil/Evil then tried a third ploy. He took Jesus to the peak of the highest mountain in the world (this story was of course current in a world that believed that the Earth was flat). The world was spread out before them and the Devil, like a prospective seller, pointed out all the kingdoms of the world. 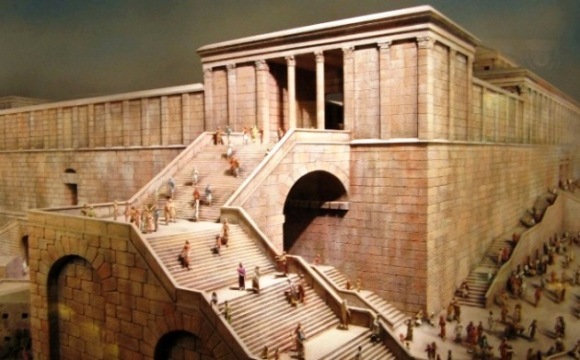 Once again there are echoes of the Old Testament, when the People of God were dissatisfied with God and were tempted to worship the Golden Calf. Here was the entire world, over which Jesus would exercise complete power. Think of all the good he could do! But the world, Jesus knew, did not belong to the Devil. It was not his to give. Satan’s promise was not to be trusted. Bowing to him was incompatible with serving God. The Devil had offered all these to Jesus, and been rebuffed. Jesus knew that in fact the Devil had no control over any of these things, and that his promises were empty. Mark’s account of the incident, shorter than Matthew’s or Luke’s accounts, is brief and to the point: the Son of God is victorious over the powers of Darkness. 6 and said to him, “To you I will give all this authority and their glory; for it has been delivered to me, and I give it to whom I will.